For over 13 years, the Harmonics Steelband has warmed the hearts Of Bay Area music lovers and party-goers with the scintillating sounds of its steel pans and its pulsating Caribbean rhythms. At parties, weddings, receptions, promotions, concerts and festivals, these exciting musicians create an ambiance that leaves a lasting impression. Through years of experience, the Harmonics have developed a dynamism in touch and tone together with a musical repertoire to suit just about any occasion. While their main course of music is the happy polyrhythms of calypso and reggae, the group also includes in its repertoire some bossa, classical and contemporary tunes. The Harmonics boasts a unique mix of panists from different caribbean islands including, Grenada, St. Lucia, Trinidad and Tobago. 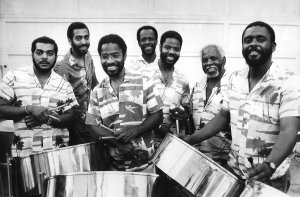 First formed in 1980 by former members of pan tuner Louis Patrick Arnold�s Steeldrummers, the group has seen some personnel changes over the years. However, the core of the group has held together steadily improving on that special magical sound for which the Harmonics have become popular. The group's instrumentation delivers a full range of musical sound - from soprano pans to bass pans, with double tenors, second pans guitar pans and cello pans providing midrange accompaniment. Rhythm support is provided by players on congas, and trap drums. Whether the occasion calls for dancing, listening or background music, the Harmonics have demonstrated they know how to make the event truly special. They bring the same enthusiasm to a cocktail party that they project on the stage of a festival or a chamber concert. The band truly exemplifies ... the Spirit of the Caribbean.